I’m still perplexed by what to do with all that zucchini. So, I thought I’d try Zucchini Jam. Part savory spread part pickle. You know, if you like pickles, this is the jam for you. And, it has a little kick of Anaheim Chili Peppers. I’m going to experiment with it a little more, but like I said, if you are a fan of pickles, this rocks! Other fun preserves you’ll love! Place a large pot over medium heat and combine zucchini, pepper, sugar, and vinegar. Boil until thermometer reaches 220 degrees. Take off heat and stir in pectin. Allow to cool for 2 minutes and stir jam for 1 minute. Place jam into containers and store in the refrigerator. I was wondering if you could include instructions for canning this jam in jars. I would love to try it but need to ship it un-refridgerated, and I would like it to keep for a while. I don’t actually can my stuff to keep it on the shelf. I usually just package for consumption within a few weeks. Let me do some research and I’ll let you know. Very unique! 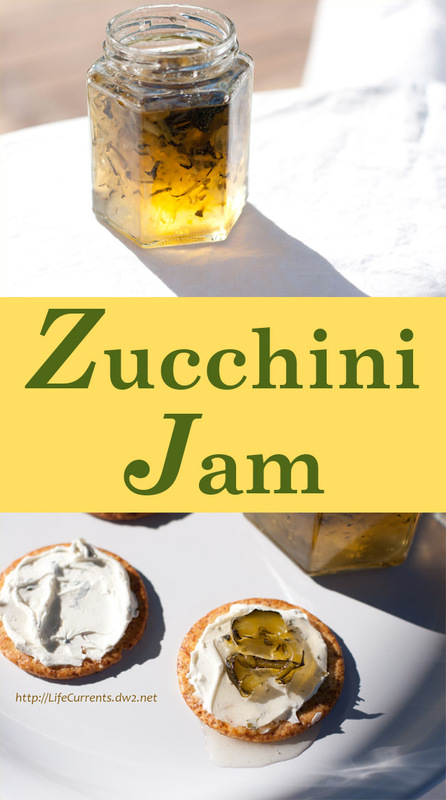 I love zucchini and I love pickles, so this is something I would like to try! I have to try this soon! It looks delicious…. This sounds awesome! I can’t wait for the zucchini to start producing so I can make some. Thanks for sharing.